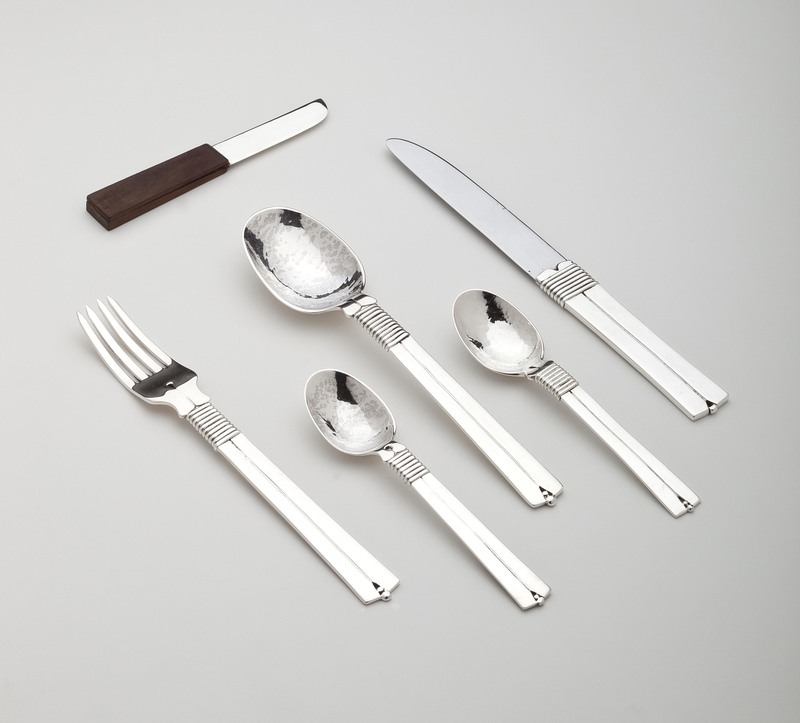 A sterling silver flatware set in the "Artesanos" pattern by William Spratling (1900-1967). The set, which includes service for six and three serving pieces, totals 39 pieces. They include: six dinner forks; five dinner knives with one steak knife which make a total of six knives; six soup spoons; 12 teaspoons (six for tea, six for dessert); six butter knives; one large serving spoon; one large ladle; one small ladle. The butter knives and ladles have rosewood handles. The steak knife has a stainless blade. All are signed with a conjoined WS mark in a circle, indicating Spratling's 1940-46 period. Very good with slight scratches to metal consistent with age and wear.